The Envirian of Reston mission is to provide both buyers and sellers of residential real estate with the strongest possible representation. As part of this pledge to serve, all of our licensed real estate agents are committed to the belief that selling a home is only part of the picture. For home buyers we believe that the process should begin with providing a complete picture of the available and surrounding Northern Virginia communities, rather than just showing available homes, one after another. After all, if you end up with a pretty home, but find yourself in a community at odds with your personal needs, you have a very poor outcome indeed. On the other hand, if you purchase less than your dream house in a community that is a perfect family match, you may feel you have achieved a great outcome. As all our agents prefer to serve buyers as a "Buyer's Agent" they will begin by providing extensive Northern Virginia neighborhood demographic information and by showing you the various Northern Virginia communities first hand. Only when you are comfortable that you know where you want to live will your Envirian of Reston agent begin to show you the various available properties. Whether it's a condo, townhouse or single family detached home; your first home, the latest in a long line of homes, or one of many investment properties, your Envirian of Reston agent will treat you with the same level of professionalism and interest. This is not a marketing statement; it is a pledge from Lee & Denese Konowe and Dean Wood, the founders of Envirian and from Dean Wood, the owner of Envirian of Reston. 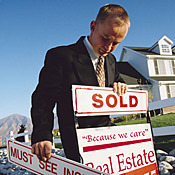 Sellers will also find that Envirian of Reston is as different a "Listing" agency as it is for buyers. With more 21st century technology and more targeted cable TV marketing visibility than any other local or national real estate firm, we are geared to get your home sold faster and for a better price than you might imagine. However, that is just the beginning, because at Envirian we are equally concerned with making sure that once your home is sold it stays sold and that all the various sale-to-closing risks are minimized. In this regard our due diligence is well known and we will continually strive to make the selling process smooth, as well as profitable. On behalf of the whole Envirian team, we welcome you to our Northern Virginia web site and hope that you find the services provided helpful. When Northern Virginia Real Estate is the question, Envirian of Reston is the Answer!